It scheduled two interventions and #Montalcinocamp was the hashtag we created for anyone interested in following the debate on Twitter. The event, organized by Vinifera Nieri Enologia, aroused interest among the oenologists and winemakers. Leading thread of the debate was sulfur dioxide (SO2). 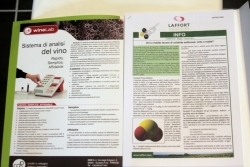 In the first intervention, Antonio Grazietti,technical support Laffort, illustrated a sperimental research led by Laffort in relation to predisposition of a wine toward combining sulfur dioxide. The study is correlated to a new and purely analytical index, TL50 (mg/L), that measures exactly this predisposition, every other conditions being equal and in the most standardized way. For more details about Grazietti’s intervention you can refer to the May – June “Laffort-info” Number (N. 88 – 2013): “Wines at low sulfur dioxide content: myth or reality?“. We inevitably talked about sulfur dioxide content as well and about yeasts involved in wine vinification process. 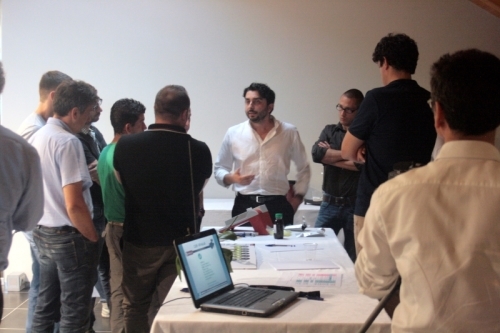 Topics that were the focus of my intervention, in which I presented wine analysis system CDR WineLab®. With CDR WineLab® it could be moreover possible to determine the new parameter TL50 (mg/L) studied by Laffort, since it requires a rapid session of free and total sulfur dioxide analysis and CDR WineLab® can do that. I illustrated CDR WineLab®’s functions and analytical potentials, talking about analysis methods for sugars and total and free sulfur dioxide in wine. At the end of the meeting participants have been trying CDR WineLab® using wine samples from their own wineries. Wine analysis: CDR WineLab® presentation in Montalcino with Laffort was last modified: May 22nd, 2017 by CDR s.r.l.